September 02, 2016, 9:28 p.m.
Lots of people don&apos;t like ads. It&apos;s no secret. 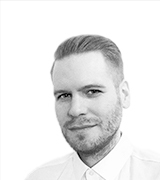 Indeed, data from YouGov Profiles shows that 72% of American adults say they feel bombarded by advertising, and 44% think commercials, billboards, and other promotional material are a waste of time. Thanks to ad blockers, denizens of the web are pushing back, and in a major way. One report estimates that, by 2017, 86.6 million US internet users will be using some sort of ad-blocking software. That&apos;s up from just under 70 million in 2016. For digital publishers who rely on display ads to generate revenue, this is a troubling trend. An analysis of why people use ad blockers reveals that their motivations extend above and beyond a mere desire to escape bombardment by ad. 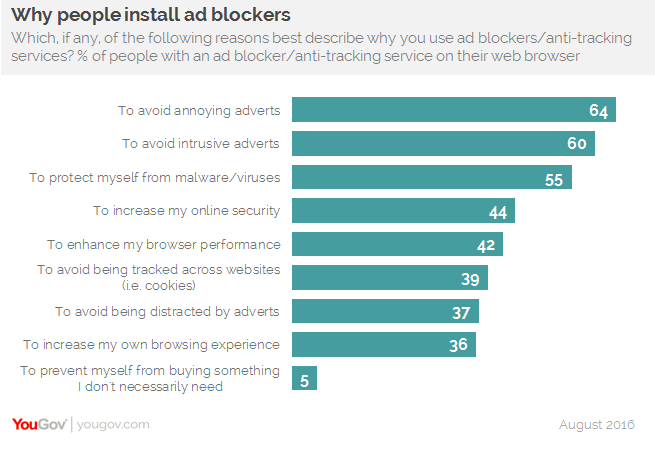 According to new data from YouGov Profiles, 55% of internet users with either an ad blocker or anti-tracking service installed on their web browser use the software to protect themselves from malware and viruses. 42% hope to enhance their browser performance, while 5% aim to mitigate the temptation to shop. When it comes to how people deploy their ad blocker, the picture becomes even more nuanced. 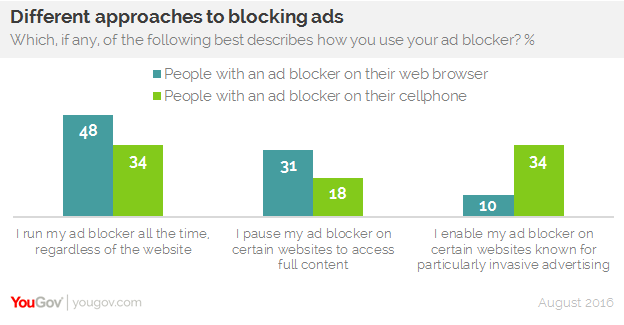 Consumers with an ad blocker installed on their web browser, for example, are more likely than consumers with an ad blocker on their smartphone to keep the program running around the clock (48% to 34%). The former group is also more likely than the latter to say they sometimes turn off their ad blocker upon visiting certain websites to access the full content (31% to 18%). That leaves one final category: turning the ad blocker on for certain websites. Here, 34% of ad-blocking cellphone users indicate that this option best describes their behavior, while only 10% of people with an ad blocker on their web browser say the same. The numbers for people with an ad blocker installed on both their web browser and cellphone come in at 52%, 20%, and 16%, respectively. A look at demographics reveals that men are more likely than women to say they use an ad blocker on their web browser. And, perhaps in a sign that ad-block usage will continue to grow, millennials aged 18-34 are more likely than all other older cohorts to use ad blockers in general.